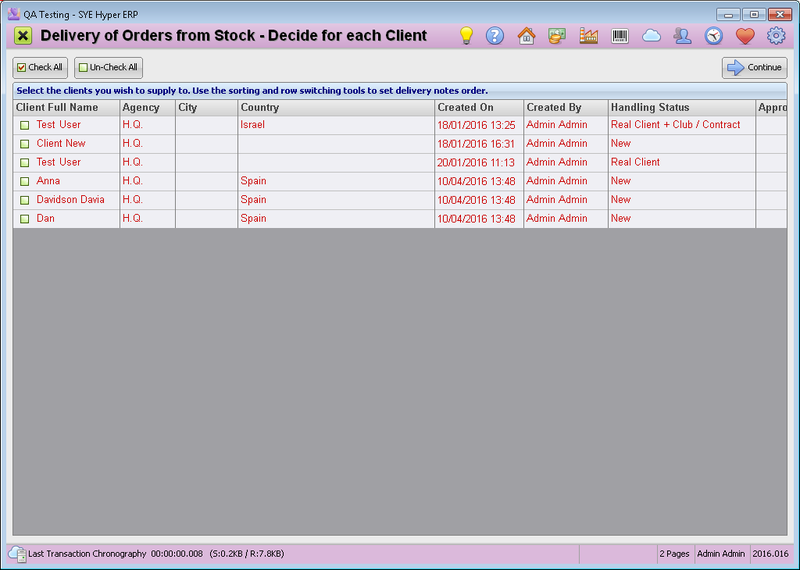 This tool for the stock management allows to deliver orders to the clients according to the current inventory, and to produce delivery notes. Only products with defined inventory quantity, will be displayed in the report. At the top of this window, in the "Stockroom Name" field, Choose the required stockroom, where the products for delivery are. Leave this field empty to display the products from all of the available stockrooms. Press the Execute Report button to continue. The table displays all of the products that have been ordered and but not delivered. 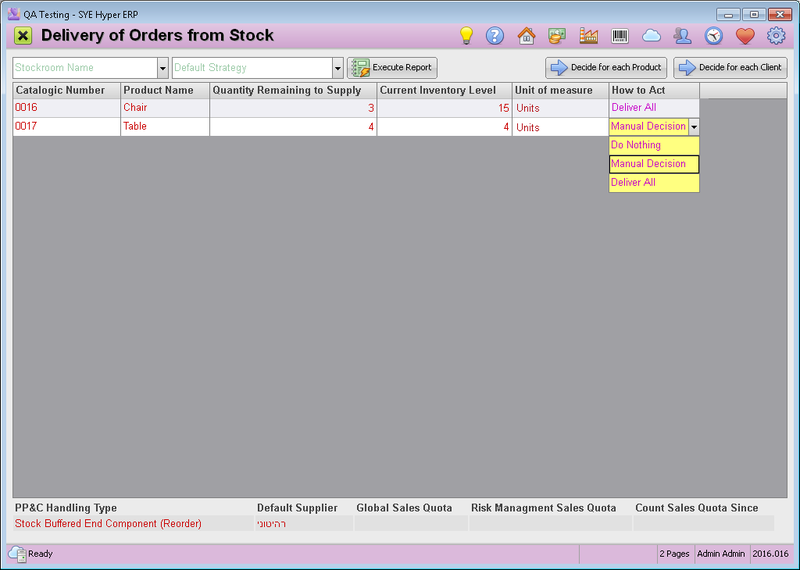 In each product record, the "Quantity Remaining to Supply" and the "Current Inventory Level" ) as also updated in the Stock Entries Wizard are displayed. Additional information for each of the table records, can be displayed at the bottom of the table. Do Nothing - For this product, do nothing about the delivery. Manual Decision - For this product, the user will manually fill in the required quantity for delivery. Deliver All - Deliver all the required quantity of the order. This option is available only if the current inventory level is equal or higher than the required quantity for the supply. Decide which order to provide, for each product. Decide how to provide the products by client. 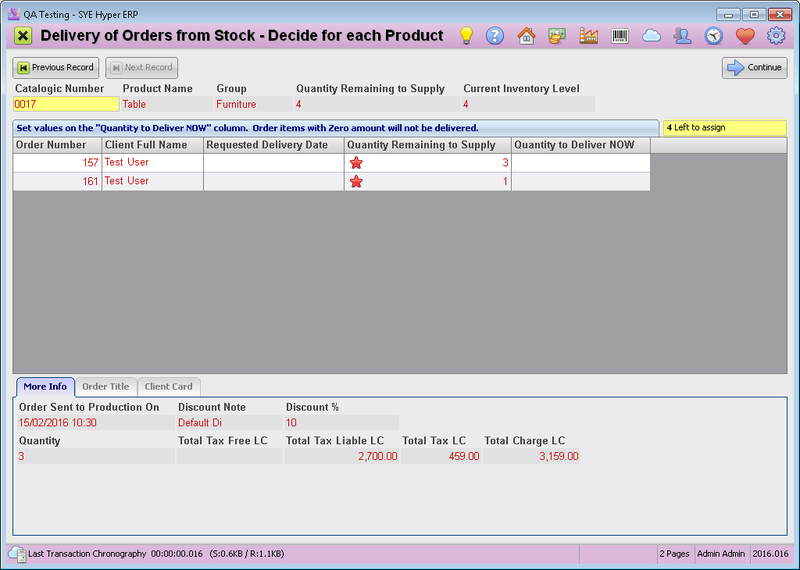 This button will open the "Delivery of Orders from Stock - Decide for Each Product" window, that displays the list of orders for the specific product and allows to decide which of the orders to supply. At the top of the page, use the Previous Record and Next Record buttons, to view the different products records. Each row in the table displays order that includes the selected product. In the "Quantity to Deliver NOW" field, fill in the required quantity. Alternatively, press the star icon to deliver all of the required quantity to supply. The amount of products left to assign (and available) is marked at the top of the table. The details of each selected order is displayed at the bottom of the table. Press the Continue button, at he top of the page. The "Delivery of Orders from Stock - Delivery Note" window will be displayed. This button will change the values of quantity column of the table, to zero. The user should manually fill in the quantity field for each of the orders in the table. Use this button to include only the selected order in the delivery note. A print preview of the delivery note. Produce the delivery note for the required orders and products. After producing the delivery note, the modifications will also be updated in the Carry out tab of the client card. After choosing the required action for each of the products, this button will display the "Delivery of Orders from Stock - Decide for Each Client" window, that displays the list of client and allows to select the clients to deliver the products to. Use the check boxes to mark the required clients and press the Continue button. 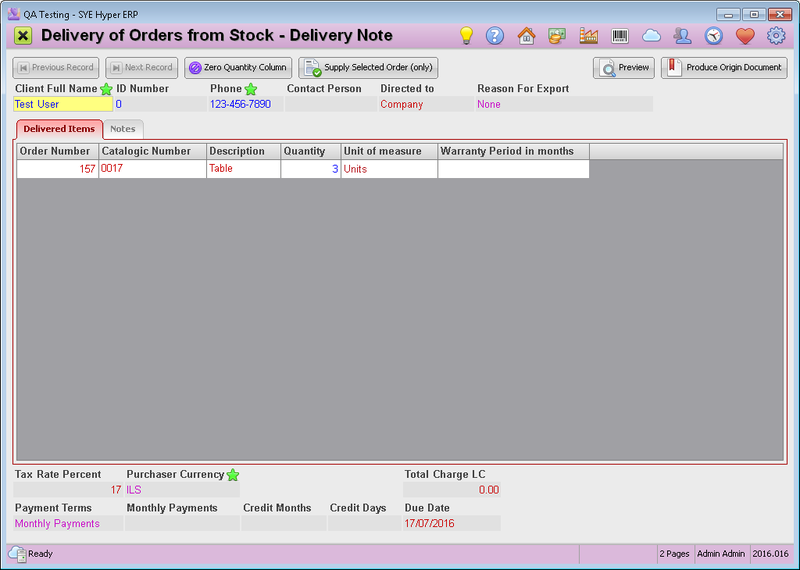 The "Delivery of Orders from Stock - Delivery Note" window (as described above) will be displayed.